Your home gym flooring is one of the most important aspects of your home gym setup, you may not have the money to buy commercial gym standard, the seamless rubber flooring you see in the free weights room, but you can make sure to get the best suited and safest flooring for your budget. The first 4 home gym flooring mats we have reviewed are for men and women who are serious about weightlifting. The next set of 3 reviews are for the foam filled interlocking mats used more for aerobics or yoga. We need to remember although much cheaper they are not best suited for bodybuilding. No Foam Filled For Weightlifting! 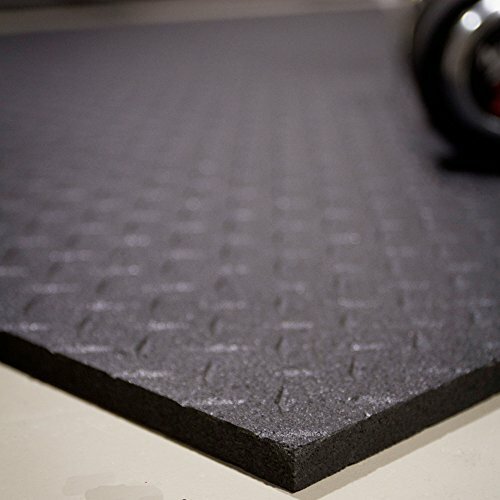 Believe me, I’ve tried training on the cheap foam mats at a friend’s home gym many years ago, and they were a nightmare, they were way too soft underfoot, absorbing a lot of the force we put into the lift, also they rip too easily and do not last long. For weightlifting, we need mats with the highest possible amount of density for our budget. Equine Stall Mat, Bed Mat, Barn Flooring, Kennel Floors – Heavy Duty Rubber Mat 4' x 6' x 1/2"
A heavy duty rubber mat, weighing in at 75lbs and 1/2″ thicks means the Xmark is going to be a tough durable mat, a very good thickness, will handle just about anything you throw at it. Slips should be kept to a minimum as the XMark mat comes with a textured non-slip surface. It’s definitely one to consider, slightly cheaper than the stall mat and nice and dense, not too much cushioning, just what you are looking for! XMark fitnesses mat is definitely geared towards the weightlifter, I could not see any weightlifter complaining about the quality, certainly good enough for any home gym. It will last for years and should be no harder to cut than the stall mats. A good buy on the whole and a mat you will not regret buying. The density of the mat is its selling point for me. DWC – The standard in powerlifting and Olympic weightlifting gyms, they’re super heavy duty and will withstand just about any weight being dropped on them without damaging the floor underneath. There is no better mat for durability, made from recycled tires these mats are tough! The mats are available in either a smooth top surface or a diamond plate surface. 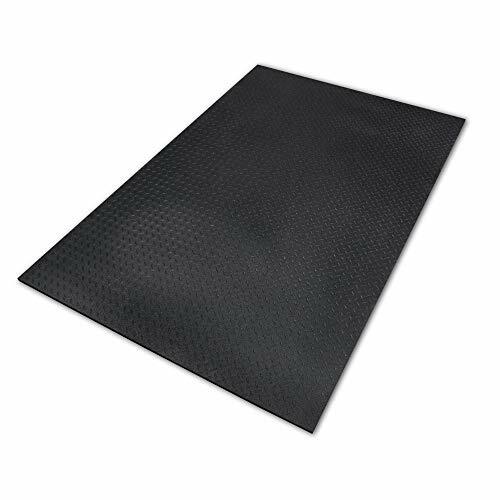 There is simply no better rubber mat for your home gym, these mats will last for years and years. The only reason the DWC mats didn’t make it into first spot, is because they are expensive and hard to get hold of, if your lucky they sometimes come into stock on Amazon. Don’t think we’re crazy recommending horse mats, they’re ultra durable, if a 1000lb horse can stand on them for years then they certainly should hold up to anything us weightlifters can throw at them. They shouldn’t move around much, the mats weigh in at 75lbs not as heavy as the DWC but still heavy enough. They’re not too hard to cut, you can use box cutters, 1/2″thick but they are dense so will hold up to overhead bar drops. I use similar ones to Equines, I bought locally, so it might be worth checking out anyone local who sells them, be aware if you are buying a few of them, the weight’s soon going to add up, so if you are not planning on purchasing from Amazon, from our link below, make sure you have a pickup truck/van to collect them from the farm supplier. Made in the US, Rubber-Cal mats are much thinner than our other heavy duty mats but come in at a more affordable price. Made from recycled rubber truck tires the mats will be hardwearing. They are thick enough to handle most weightlifters’ needs but I’d be hesitant dropping any weight from a height if you are training to failure, as the thickness and density of the mats might not protect the floor from such force. Easy to cut using a utility knife. The lighter mats will move around more so I’d suggest using an adhesive to stick them in place. The mats have received good reviews. There have been a few issues of the flooring once unpacked rolling back up again, but that’s easy enough to fix, place it down the other way and put a few weights on top of it for a day or two, the mat will soon straighten out. 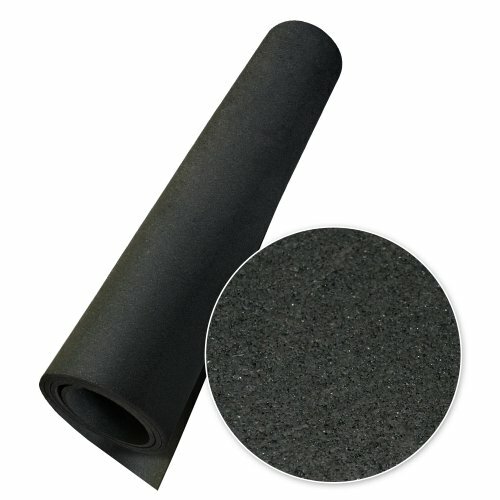 The rubber cal mats have a slight texture to them so should help with any slippage issues. Type of Flooring, What it Needs to Do! Protect the flooring underneath. Can it take heavy overhead weight drops and deadlifts? Is it easy to clean up? Does the mat absorb sweat? Will it reduce noise because we will definitely have grip slips, drop weights, especially if training to failure (important if you own an apartment)? You should first be thinking whether or not you will need an underlying base for your rubber flooring, if you’re going to put the rubber flooring over concrete such as in a garage, you can forgo the underlying base. If you plan on putting the rubber on top of carpet or wooden floors, then we highly recommend you put down a layer of three quarter inch plywood underneath. This will give you a nice solid base and will give you the extra protection if you drop heavy weights. 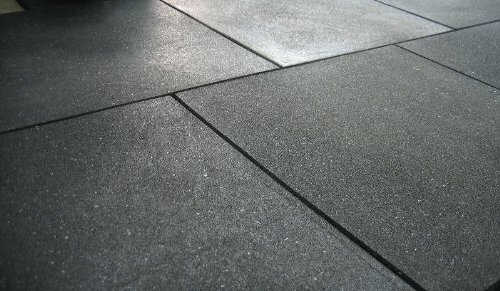 Density will be the most important aspect of choosing the right rubber flooring for your home gym, for weight lifting you will want the densest of materials, we don’t need any bounce from it or as little as possible, “we want minimal force into the floor and maximum force into our efforts”, says Craig Cecil author of Bodybuilding At Home. It’s best to try and avoid the mass marketed 2x2 floormats sold in packages, they are cheaply made and do not have the required density we are looking for. Cheaply made mats are ok for placing under any cardio equipment or anything that doesn’t move and will still protect the floor but are not suited for racks. Most gym flooring is available in thicknesses from 1/4″ to 3/4″. When choosing thickness you will find the thicker the rubber the higher the price. If you choose a more dense rubber flooring this may allow you have a slightly thinner rubber, but usually doesn’t save you much. The thickness and density will primarily determine the durability of a mat, dense and thick at one end will last longest. Light and thin at the other, but even light and thin rubber is a better choice than any foam mat. Mats will have to be securely placed up against each other and so may have to be cut accurately to fit. Might be a good idea to buy strips from a hardware store to put under mats to make more secure. How Much Rubber Flooring Will I Need? Storage, it’s a good idea to have rubber flooring under the storage, its easy for slips here and weights falling, but it less important than the other two main areas. So if on a budget you could leave this part out. Once you have chosen the correct flooring for your home gym we thought you might like a little help showing you the best way to cut the rubber flooring, here’s a short how-to video. As we mentioned earlier foam filled mats are not considered the best idea for serious weightlifters they are however great for bodyweight exercises, yoga, and many other indoor activities. Let’s not forget, some of the high-density foam mats can be used under your fitness equipment, here they’ll do an excellent job at protecting your floors and are, in general, a much cheaper option for this job than rubber.